Prosper is one of the largest peer to peer lending platforms in the US. Loans of up to $35,000 are available which can be used for many purposes. Investors are able to achieve good returns which are dependent on the credit grade of the borrower. They can also diversify their investments across credit grades to achieve a balanced portfolio. 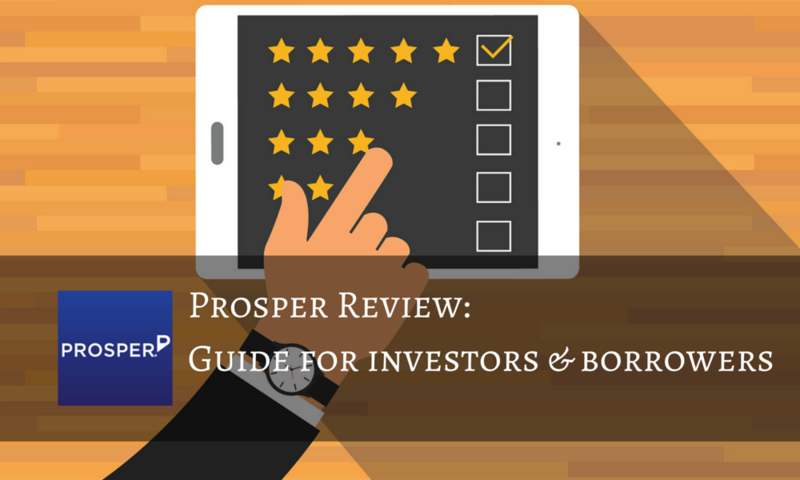 In this Prosper review we look at the fundamentals of the company and compare it briefly with similar peer to peer lending platforms Lending Club and Zopa, and with Bitbond, a peer to peer bitcoin lending platform. Ryan has documented his excellent experiences on the platform already, and I urge you to check it out. Below, you will find an updated Prosper review, giving both borrowers and investors some more insights into the mechanics of p2p marketplaces. When Prosper was launched in 2006 it was a very different market place than it is today. The first peer-to-peer lending site based in the US, from it modest beginnings it has grown almost exponentially, and in July 2015 it passed the landmark of having originated a total of $4 billion in loans. Given that in its early days the peer to peer lending model represented relatively unchartered waters, it isn’t surprising that it wasn’t all plain sailing, and that the business did make a few errors on the way. In the early days Prosper used a kind of Dutch auction system where investors would bid on the interest rates they required to finance loans. These left investors vulnerable to defaults as the tendency was for investors to under-price risk, and many early investors lost money; of course the timing was unfortunate given that this coincided with one of the biggest global economic downturns in history. Even so, many Prosper reviews in the press were highly critical and the overall effect, was to damage the reputation of peer to peer lending generally. In 2010 Prosper changed their business model. Rather than the interest rates being determined by lenders and borrowers, the business itself set the interest rates based on their assessment of the credit risk of individual loan applicants. The credit risk is based on the applicant’s credit rating with the rating agencies along with other financial information and any previous borrowing history on the site. Lenders simply choose whether or not to lend at the stated interest rate after reviewing information on the loan applicant. According to Prosper’s own review on its website, “Prosper provides investors direct, low cost access to high-yield consumer loans from creditworthy borrowers.” What makes prosper different from conventional investment vehicles is that investors can choose their own projected returns based on the risk that they are willing to accept. As described below, each borrower is assigned a Prosper credit rating, and this is used to determine the interest rate they will be charged. While a borrower with the highest credit grade will be charged an APR of around 6% to 8.7%, a borrower with an average credit rating will be charged around 13% to 15.8%, and a borrower who is considered to be high risk will be charged up to 36%. Interest rates also depend on the loan term and on whether the borrower has any previous history of Prosper loans. After allowing for defaults, typical returns on a low risk investment are around 5.5%, on an average risk around 11.1%, and on a high risk 10.8%. As we show below, risks to investors reduce as they spread their investments across multiple loans and credit grades. Typical returns made by such investors are between 10.5% to 12%. All new borrowers on Prosper must have a minimum FICO credit rating of 640. Prosper reviews the credit rating and other financial information for the applicant and then calculates the Prosper Rating. Prosper Ratings are broken down into seven categories, with each category being associated with estimates of default rates which are stated as the annual loss rate for that category. For instance, a Prosper AA rating, the highest possible, has an estimated annual loss rate (EALR) of 1.99% or lower, while a Prosper HR rating (high risk) has an EALR of 15% or higher. The ratings in between these are A, B, C, D, and E.
Prosper’s revenue is derived from the transaction fees it charges its borrowers and investors. Borrowers are charged a one-off fee of between 1% and 5% of the value of the loan, and investors are charged a service fee of 1% of annual transactions. Along with similar peer to peer lenders Prosper operates a highly transparent system. Investors have a full view of borrowers’ credit data enabling them to develop their own risk adjusted projected return model. The data includes items such as the credit score, the Prosper Rating, employment status, homeowner status, loan repayment history, occupation, income, credit card utilisation, and more; Prosper reviews at least sixteen levels of credit data. The status of every loan taken out on the site is available to every investor. While good returns are available through Prosper, investing in the platform carries a higher degree or risk than investing in a traditional savings account. While there are likely to be some defaults on loans, these are balanced by the higher returns and with a diversified portfolio overall risks of default can be managed. The chances of failing to make a positive return decrease with increasing diversity. According to Prosper, investors with 400 notes have just a 1.1% chance of making returns of less than 1.1%. This represents a minimum investment of $10,000. The other risk is that Prosper enters into bankruptcy. Given its level of capital, it isn’t likely, but it remains a possibility. Should it happen then investors receive a degree of protection. All loans and notes are owned by Prosper Funding LLC; a subsidiary of Prosper Marketplace Inc. Prosper Funding LLC is a legal entity that has been approved by the SEC to continue servicing existing loans should the Prosper platform enter bankruptcy. In other words, the loans are quite separate from the platform. Prosper Marketplace Inc. owns just the IP and the technology, which in the case of bankruptcy would be sold off; the loans would not be involved. However, it would not be possible to issue any new loans. The protection applies equally to individual and corporate investors. There are now many competitive peer to per lending platforms. The best known in the US is Lending Club which recently became a public owned company following its IPO in December 2014. Loans of up to $35,000 are available with a minimum APR of 5.99%. As with Prosper, to invest and borrow you must be resident in the US. Funding Circle operates in both the UK and US. Specialising in loans to small businesses, it has facilitated over £1 billion of loans in the UK alone. Loans are available from £5,000 up to £1 million. Typical returns for investors are around 70%. Funding Circle only accepts borrowers that are already established and credit worthy; depending on their credit rating interests rates vary from around 6% to 18%. Zopa was the first peer to peer lending platform which launched in 2004. It is available to investors and borrowers in the UK. Loans are available from between £1,000 and £25,000 with interest rates starting at just 3.9%. Investors can choose average projected returns of between 3.8% and 5.0% after defaults. Bitbond is a different kind of peer to peer lending platform in that it deals in bitcoins rather than currencies, however the value of its bitcoin loans and investments are tied to the dollar. The use of bitcoins means that loans are completely independent of banks and are not restricted to specific countries or states. Fees are cheaper than Prosper – lenders pay no fees at all compared to Prosper lender fees of 1%, borrowers pay just 0.5% to 3% compared to the 1.1 to 5% charged by Prosper. Peer to peer lending has changed the way in which we are able to borrow money and is providing an exciting new opportunity for investors. In this Prosper review we have glimpsed at the history of the company from its origins to the present time and the advantages that if offers both lenders and borrowers have been highlighted. There are many alternatives to Prosper; we have mentioned just a few of them, in particular Lending Club which is the other main platform in the US, Funding Circle which operates in both the UK and US, Zopa which is based in the UK, and Bitbond which provides an alternative peer to peer cross-border lending model based on cryptocurrency. This article is for your information only, and should not be considered as investment advice. Welcome to part 4 of our cryptocurrency adventure. This month’s bitcoin lending report should be short and sweet and will cover my new investments, as well as my first returns. 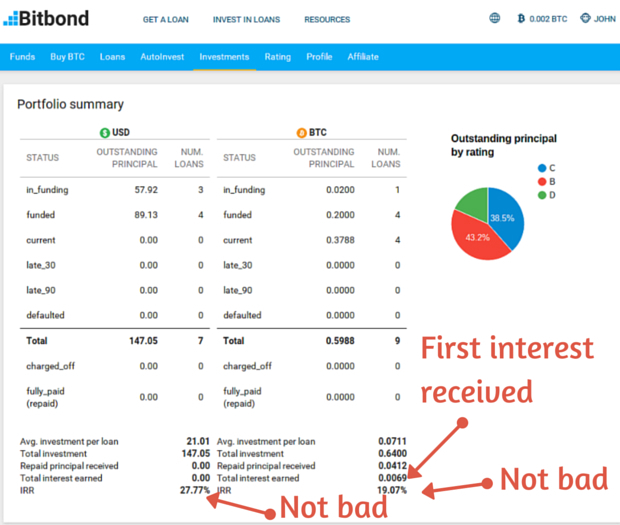 If this is your first monthly report, follow the links to find out about my investment strategy on Bitbond and why I am using a bitcoin lending platform to begin with. There are plenty of other smaller signals which made me lend to these borrowers, but these 4 points are the ones that swayed me. As you can see, my portfolio now includes 16 loans, spread nicely across currencies and medium-to-high risk credit ratings. My expected internal rate of return (IRR) for bitcoin denominated loans is 27.77% while US dollar denominated loans have an expected IRR of just over 19%. 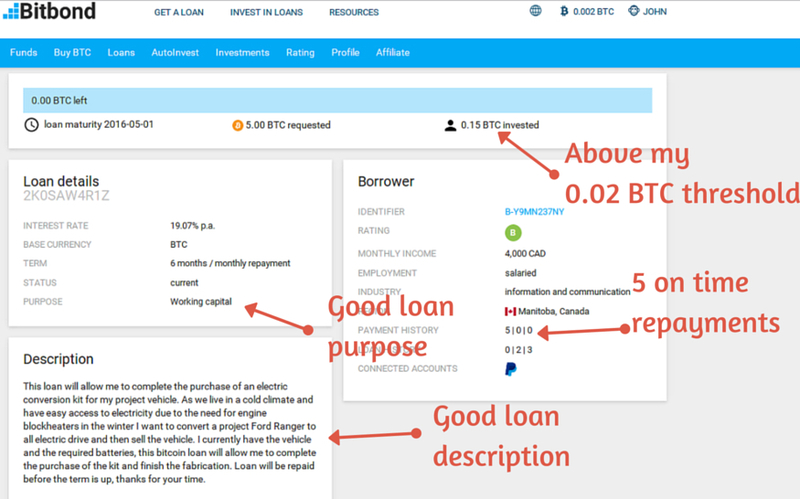 I believe that the IRR on Bitbond is calculated independently of probable defaults, so it is fair to assume that a few of these borrowers will fall through, bringing my IRR down in the process. That being said, if I end up making a close-to or above double-digit return I will be very happy. The fourth loan is currently in a grace period and I am hopeful that he will repay in the coming days. Looking at the loan, we can see that he otherwise has a solid repayment history, which is why I am confident he will repay in time. Stupidly, I invested around 0.15 BTC in this bitcoin loan which is way above the threshold I set myself at the beginning. Interestingly, the three borrowers who repaid on time, all have significant eBay accounts connected, whereas the late borrower does not. This is a good portent for the vast majority of my bitcoin investments on Bitbond, as they validate my lending strategy, highlighting the importance of high-quality eBay accounts. Ending December’s report on a high note, the bitcoin interest I received is significantly more than I could have hoped for when I placed the investment. This is due to the meteoric increase in bitcoin’s price since I placed the bids. Specifically, the value of my bitcoin investments in october, when I placed the bids for which I am now receiving interest, was 0.45 BTC or around $117.90. On the 1st of December, when I received my repayment, the value of 0.45 BTC had grown to $162.26, bringing up the value of my received interest significantly. Now, I completely understand that the price of bitcoin is volatile and a price crash might see the value of my bitcoin returns come back down, but that is why I have diversified my Bitbond lending portfolio to include a healthy mixture of currencies. I have to say that in total I am very happy with my experience on Bitbond so far. Receiving my first interest is reassuring and I am now confident that I can make significant earnings if I stick to my investment strategy. Connected and high quality ebay accounts seem to be a good indication of a borrowers ability to repay, as shown by the interest I have received already. Further, I need to remember to keep my investments in individual loans around the 0.02 BTC mark, and only lend more if the borrowers show themselves to be the perfect fit, as two did this month. Overall, I am excited to see what the future holds for my bitcoin investments. Let me know what your thoughts on bitcoin lending are, and merry Christmas.